The chemistry within the New York Islanders was volatile for the majority of last season, while small sparks of hope ignited a little fire towards the tail end. When half of the Islanders team was comprised of AHL players, the team possessed incredible chemistry because those young guys were so accustomed to playing with one another. The team was energized and stable, thus the games flowed very well, especially in the absence of its captain John Tavares. For stability, as we learned in Chemistry class, there must be an equal number of protons within an atom as there are electrons surrounding this atom. Positive and negative energy combine to form a neutral and steady entity. Imbalance destabilizes the atom, but atoms can stabilize by teaming up with another unstable atom (or even a few atoms) in order to form a bond. This idea of joining together various atoms, which may be unstable alone, to form a more powerful and sustainable bond is what a hockey coach tries to do with his players at the start of each season. With guys playing at various levels, the Isles now have layers of reinforcement which will certainly help. 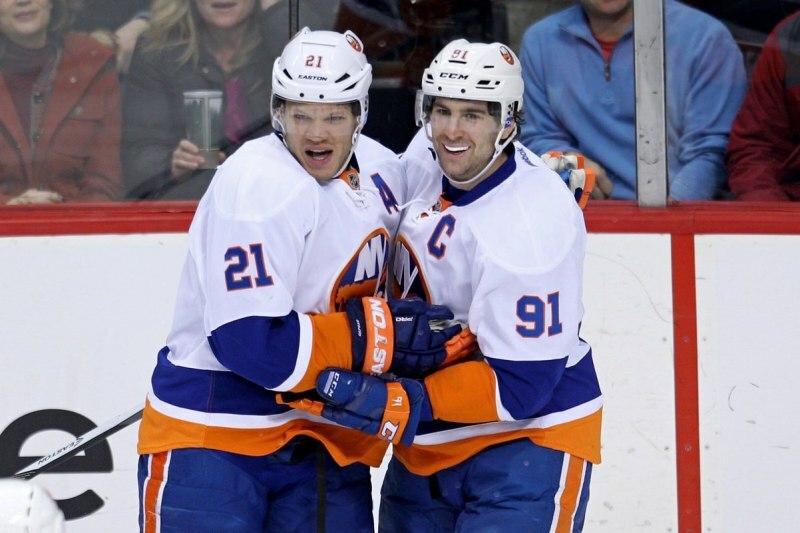 Here is Part One of a Two-Part Analysis of the Islanders’ chemistry and depth: FORWARDS. Part Two will look at defense. As far as depth and layers within the Islanders organization goes, there are four tiers and each tier mentors the tier below it. Tier 4 consists of the more veteran forwards, who have either been in the NHL for a while or are up there in age, such as Eric Boulton (age 38; 15th NHL season), Colin McDonald (age 29; 3rd season), Jack Skille (age 27; 8th season), Cal Clutterbuck (26; 8th season), and Josh Bailey (24; 7th season). They are like professors, who can mentor younger players. McDonald serves as a mentor for the younger players on the team, is always helping them out, and was the Islanders’ nominee for the Masterton Trophy last season. The award is given to the player “who best exemplifies the qualities of perseverance, sportsmanship, and dedication” to the sport. McDonald didn’t become a “regular NHLer until joining the Islanders for [the 2013] training camp after 405 AHL games.” He did, however, captain the Sound Tigers and possesses much hockey wisdom. In this video above, Colin McDonald demonstrates his chemistry with Matt Martin as he follows the puck behind the net and makes a great pass to Martin, who shoots and scores to tie the game against the Vancouver Canucks. Colin McDonald and Tavares have been living together for at least a couple of years now. (We all recall McDonald’s campaign to get Tavares on the cover of NHL14 so that he wouldn’t have to sleep on a cardboard box on the floor?) McDonald and Tavares could not have more different personalities, but they complement one another well. Now that GM Snow has acquired depth and built more chemistry among the more effective forwards, there is little room for those who cannot produce on a consistent basis. Bolton, McDonald, Skille, Bailey, and Clutterbuck are likely to serve as mentors who have wisdom of age or wisdom of being in the NHL for many years. The most effective layer—or tier—is Tier 3, which includes John Tavares and Kyle Okposo, and their chemistry on the ice is of the purest kind. These players liken to the “Seniors and Juniors” in high school who are smart enough to take Advanced Placement Chemistry. Also at Tier 3 are new Islanders Mikhail Grabovski (age 30) and Nikolay Kulemin (age 28). GM Snow needed to bulk up the “most effective players” layer and could not have Tavares, Okposo, and Frans Nielsen—who played exceptionally well last season—essentially carrying most of the weight. The chemistry between Grabovski and Kulemin is well-known since the time they played together in Toronto and will be helpful. Michael Grabner, Cory Conacher, and Matt Martin fall into this Tier 3 layer due to their potential and experience. Grabner has the capacity to excel on “both sides of the puck” if he applies himself, and will surely be needed as one of the top nine forwards this season. Conacher originally hit the ground running with the Tampa Bay Lightning, but later slowed down to more of a jog with the Ottawa Senators and Buffalo Sabres. Finally, with a zealot like Matt Martin who took on quite a leadership role last season when both Tavares and Okposo were injured, the Isles would be amiss to ignore his contributions. A void that needs to be filled right now is to find the third linemate for Tavares and Okposo. In the preseason game against the Carolina Hurricanes on September 24, 2014, Grabovski seemed to find chemistry with the dynamic duo, thus a potential trio could be formed. Tier 2 is similar to the “Sophomore” forwards of the Islanders, some of which have already played with the Islanders and all of which were invited to Islanders Training Camp this summer. Mentored by Tiers 3 and 4 above them, Brock Nelson, Anders Lee, Ryan Strome, Casey Cizikas, and Sebastian Collberg are vying for a permanent spot on the team. Cizikas—with his ability to make timely hits—often has fantastic chemistry on the fourth line with Martin and McDonald. Nelson has meshed nicely with Tavares and Okposo on the top line. Strome has the versatility to play center or on wing, which could enable him to make the roster. Lee also was impressive last season. Chemistry is a large part of whether or not a player makes the roster, and whether Collberg has sparks with the other players is still up in the air. However, the trio of Okposo-Tavares-Vanek were the most productive line in the entire NHL, and had tremendous chemistry. Sadly, as all good things often come to an end, Vanek moved on, and the Islanders are now in search of his replacement. It could be from this Tier: either Nelson, Strome, or Lee. Last, but not least, we have our “Freshmen” forwards, who are still developing in the juniors or the AHL. These include the stars who were good enough to be invited to Training Camp, but most likely will not make the big league just yet. These young men have the fortune to be mentored by all of the skilled players above them in Tiers 2, 3, and 4. Michael Dal Colle skated with Kyle Okposo and Ryan Strome during training camp, and Joshua Ho-Sang received advice from John Tavares. Other forwards who made their NHL debuts at the end of last season, and a few AHL-level Training Camp invitees also fall into Tier 1. During the Islanders’ first home preseason game on September 24, 2014, fans seemed to experience déjà vu; the special teams were less than desirable in a 4-2 loss against the Carolina Hurricanes. Although Canes’ defenseman Brett Bellemore took four penalties within 6:19, the Islanders failed to convert on their power plays. Then the Isles took seven penalties themselves and Tavares stated they worked on the PK the day before and haven’t yet worked on the power play. Training camp and the preseason is the time for the coaches to experiment and combine random elements. If the lab experiment blows up in the coaches’ faces, no harm is done. This is where the team can see what needs to be fixed. The mentors must remain level-headed, players will test out what feels comfortable, and the coaches will craft a team most durable to last the entire length of the season, through the playoffs. The good news for the Islanders is that all four layers/tiers are working under the same system, and the atoms seem to be falling into place, one by one, to form what will hopefully be a stable and powerful team. Do you think the Islanders will have better chemistry this season, and which players will best fit together? Let me know in the Comments.